The Town: Some towns in the Outlands have good parts and bad parts. Bedlam, on the other hand, has bad parts and worse parts. It’s spread out like a giant fan against the side of Maurash, an active volcano. At the bottom of the hill (the base of the fan) is the Gate to Pandemonium, and from there eight worn roads spread outward and run like spines up the slope. The worst of it is at the bottom of the hill, in what locals call the Gatemouth district. That area pays the music for being so close to the gate – it’s strangled by chaos from the plane beyond. Here, kips and shops of every architectural style jam together at can’t-be angles, with little regard for their neighbours. Throw in strangely curved walls and corners that seem to alter space itself, and you’ve got the kind of place that makes a berk look twice. Head uphill, though, and the burg starts to take a saner turn – the roads get a bit more workable, the buildings a touch more steady. The really top-shelf quarters (top-shelf for Bedlam, anyway) are found near the top of the hill, in what’s called the Citadel district. The gate’s inside the base of the tower, with a half-dozen entrances around the perimeter. These entrances, called blastgates, are set in archways of iron and stone. Day and night, they spew out a rank, howling wind that sweeps up and over the city. The Populace: Primes who’ve been to both Bedlam and Xaos might think the people in each town are pretty much the same – barmy. 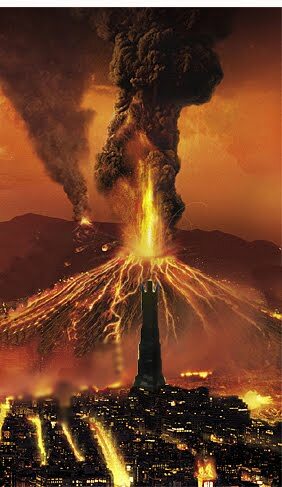 But, unlike the natives of Xaos, Belamites are malicious, petty, and hateful. No one knows why, though a sage once claimed the difference is the people of Xaos have come to terms with their madness, but the people of Bedlam have not. The sod was quickly torn to pieces by a pack of Bedlamites, but no one’s sure if that meant he was right or wrong. 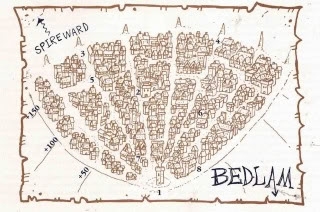 Residents of Bedlam include gnolls, bugbears, and humans, with a good mixture of the other mortal races, none of them all that sane. The Bleak Cabal is the strongest faction in town, and often tries to talk berks into going through the gate, which tends to end their mortal lives. The natives of Bedlam are twitchy and self-absorbed, and many of them hear (and argue with) voices that seem to come out of the air. After a few days in Bedlam, a basher tends to hear voices himself, voices that tell him to let go of reason, emotion, and, eventually, sanity. The Hoi Polloi: The wizard Tharick Bleakshadow is the current Keeper of Bedlam. He’s a member of the Xaositects, and a body flipping through Kragspaw’s Ponderous Book of Words would probably find his picture next to “dotty old wizard.” Fact is, he’s senile, as much a threat to his own cutters as to the enemies of Bedlam. No one ever seems to know what he’ll do next (Bleakshadow included), but no one’s been able to boot him out either. Apart from the Keeper, three groups of bashers put the hard hand to troublemakers in town. Farthest up on the hill, the Windlancers patrol the Citadel district – they’re more or less a sane bunch, and they try to protect the place. Down around midtown, a shakier group of semi-criminals called the Sarex hold sway. They’re more like personal bodyguards, though the bodies they guard are usually their own. Finally down in the depths, near the gate, a band of adventuring sods tries to stem the tide of madness. Not surprisingly, they’re known as the Misguided. Local Sites: Each of the three main areas of Bedlam has its own flavour. The safest of the lot is the Citadel district, the arc of strong buildings on the hilltop. The powerful bloods who live up there want to profit from the gate without being crushed by its madness. A few, like Althax Darkfleece, even hope to cure it. Darkfleece is a bariaur priestess of Shekinester, and she looks after the insane in her keep, the Sanatorium. She also provides a resting-place to good creatures who been battered by Pandemonium. Midtown is the wide area between the Citadel’s curve and the immediate surroundings of the gate. Here, a visitor’ll find most of the inns and taverns in town, along with a full assortment of barmies. The Dark Draft and the Bonechill Wind are both popular kips, but the best place for travellers (especially cutters of an artistic bent) is Weylund’s Inn. Run by a dwarf named Pockmarked Weylund, it’s an island of quiet in a addle-coved town. The area right around the entrance to Pandemonium is known as Gatemouth, the stompng ground for most of the openly nasty and evil-aligned beings in town. The lowest (and most popular) dive in Gatemouth is the Eye and Dagger, run by a tiefling named Grist. This is a common hangout for fiends, tanar’ri, and the berks who choose to deal with them. Current Chant: Word on the street warns of an upcoming invasion of Bedlam. Some think the bashers will come through the gate, while others say they’ll come from the Outlands on their way to the gate. Berks who listen to these rumours should remember who they’re dealing with. The town’s been attacked before, but never when the locals say it’s going to happen. Planars joke that when the barmies stop talking about an invasion, then you’ll see the armies arrive. Another problem is Bleakshadow. He’s been acting even twitchier than normal, complaining that some dark masters are plotting to overthrow him. Most people think he’s just having delusions, but the wizard’s torched a number of homes and inns in the Citadel and Midtown districts.